I have been meaning to share this recipe with you for quite some time. We had it at Easter and everyone really liked it. It is so easy, can be made up the day before, and is delicious. What more could a person want? Put chopped cabbage and carrots in bowl. Sprinkle with green onions. Sprinkle with 1/2 cup sugar. Mix dressing ingredients. Pour over salad. DO NOT MIX. Cover salad and place in refrigerator for several hours or over night. Toss right before serving. The wonderful thing is that cabbage and carrots are such hearty vegetables, they don’t get limp when in contact with the dressing. The dressing has a nice sweet and sour, almost oriental style flavor. This is great for a crowd! I have had to eliminate MSG from my diet. There are lots of people who are sensitive to this additive and you can now add me to that list. This has forced me to cook more from scratch because MSG is everywhere in prepared foods. It is in most packaged gravy mixes (and I love gravy). It is in most canned soups (and I love a little soup for lunch). It is in so many things I can’t list them all here. So, at the advanced age of 51 I am having to cook. Sigh. 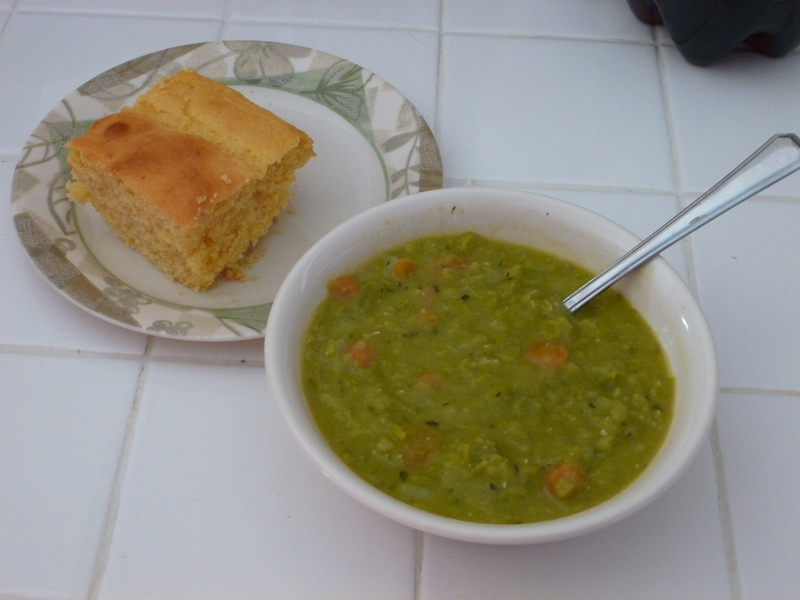 Last week I made split pea soup from scratch. Hubby declared it was “excellent” which made me very proud! I have to admit it was pretty darn good, if I do say so myself. I think it was even worth the half hour I spent chopping veggies for it. The recipe I started off with was courtesy of Martha Stewart. However, I made a few changes that I think mad e it better such as adding more chicken broth and less water and adding a little garlic powder. I made some corn bread to go with it. Yum! Here is Martha’s split pea soup, with a little help from Kim. Ham bone, slice of ham, or I used 1 package uncured English style bacon from Fresh and Easy Market. In a Dutch oven or other large pot, heat olive oil and add chopped onion, celery, carrots, thyme and garlic. Cook until veggies begin to soften, about 5 to 8 minutes. Add broth, water, split peas, and ham or bacon. Bring to a boil then reduce heat to medium-low and partly cover pot with lid. Simmer until peas are soft, about 30 – 45 minutes. When the soup first begins to boil you may want to skim the foam off that rises to the top. Many recipes, including Martha’s, have you puree half of the soup to give it that creamy consistency. Yeah, I don’t think so. I just let the soup cook a little longer and the peas break down and fall apart and that is good enough for me. But feel free to puree away if you would like, Martha says to work in batches and only fill the blender half full each time and to make sure the lid is on the blender. You don’t want hot soup going everywhere! 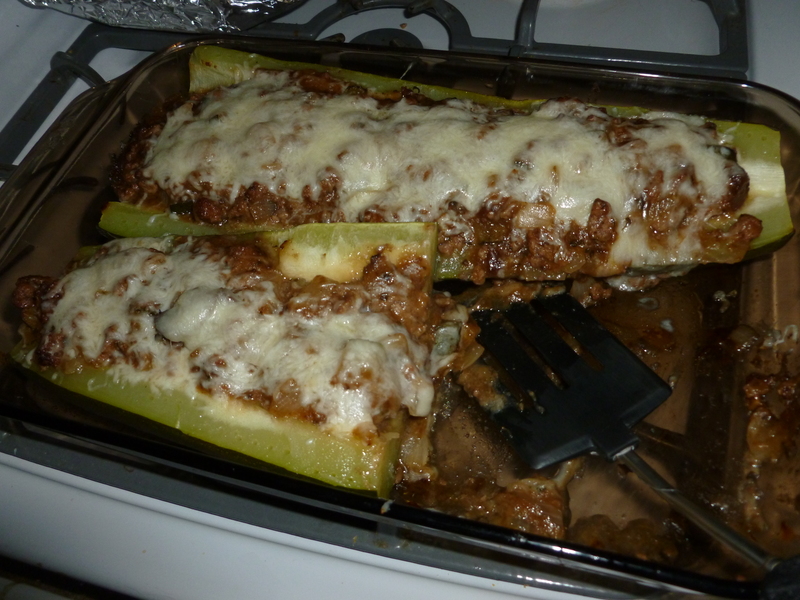 My friend and neighbor Linda brought a dish to our house that was a big hit! Half salad/half dessert, the best part of this yummy dish are the sweet crunchy bits. The party game during dinner became “Guess what the crunchy bits are.” I finally cornered Linda and found out that they were pretzels! These pretzels were baked with butter and sugar to make them extra yummy! Linda tells me that this is not a dish to make ahead or to make extra for the next day because the pretzels lose their crunchiness overnight. However, I suppose you could make extra and just save the pretzels to be added right before serving. Whatever the case, enjoy! Crush the pretzels and pour into a 9×13 backing pan. Slice the stick of butter and place over the pretzels. Sprinkle sugar over the pretzels. Bake at 350 degrees for 12-15 minutes, stirring every 2-3 minutes. After removing from the oven, continue to stir frequently until mixture is cool. Cream together the cream cheese and the sugar. Add drained crushed pineapple and mix well. Fold in the Cool Whip. Add pretzels just prior to serving so they stay crisp. Sorry, I don’t have a photo of the salad. 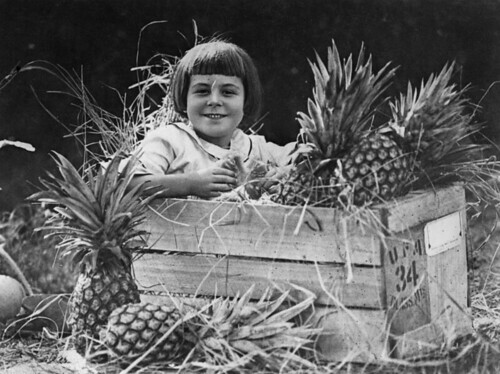 Instead, feel free to contemplate how uncomfortable it was for this little girl to sit in a box of pineapples….